August 23, 2008 is the 14th major day of the 2008 Olympic games, the below article lists some of the highlights. Norway‘s Andreas Thorkildsen took home the gold on Saturday, with a final score of 90.57, a new olympic record. Silver went to Ainars Kovals, who represents Latvia, with a final score of 86.64, a new personal best for him. Tero Pitkamaki of Finland received bronze. With a final time of 12.57.82, a new olympic record, Kenenisa Bekele of Ethiopia took home gold in the 5000m dash. Following with silver and bronze was Kenya‘s Eliud Kipchoge and Edwin Cheruiyot Soi. Brazil took gold by defeating the United States (silver) 3-1 in the gold medal match of Women’s Indoor Volleyball. China defeated Cuba 3-1 to take bronze. Kenya’s Nancy Jebet Langat in the women’s 1500m dash final won gold, had a time of 4.00.23, a personal best for her. She was followed by Ukraine‘s Iryna Lishchynska and Nataliya Tobias, with silver and bronze respectively. For baseball, in the men’s gold game between Cuba and South Korea, South Korea prevailed with a score 2-3, over nine innings, with Cuba taking silver. For the bronze game, the United States came up against Japan and won with a final score 8-4, also over nine innings. Australian Matthew Mitcham took home gold with a final score of 537.95 in men’s 10m diving. He was followed by Luxin Zhou of China with silver, and Russian Gleb Galperin with bronze. On August 11, US Senator and 2008 presidential republican candidate John McCain gave a speech regarding the crisis between Georgia and Russia. Following the speech, a regular Wikipedia editor noticed that his speech was very similar to an article on Wikipedia also regarding the crisis, in what could be considered plagiarism. Wikinews was able to talk to that editor about how he found out about the similarities and what he did in response. Wikinews also took a deeper look at the claim and investigated further. While reading the first few paragraphs, the Wikipedia editor Killing Vector, who wishes to be called by his contributor name in fear of retribution for coming forward with the claim, noticed a striking similarity to McCain’s speech and the Wikipedia article on the country of Georgia. Not only did he notice the similarities, but after reading through the article’s edit history, ‘Killing Vector’ noticed that his speech might have been lifted from Wikipedia, with some of the material in McCain’s speech dating prior to the start of the Georgian and Russian crisis. “I began reading the text of McCain’s address on the Georgia crisis, and as I was browsing it the irregularity jumped out almost immediately. The paragraphs which discussed the history of Georgia simply didn’t fit with the rest of the speech; the rhetorical style was jarringly different. I figured, “where’s someone in a hurry going to get basic information on the Republic of Georgia?” I opened up Wikipedia, went to the article, picked a recent but not current revision more or less at random (July 24th), and hit gold on the first try; McCain’s speech and the Wikipedia article had significant strings of words in common, emphasized the same events, made largely the same word choices,” said Vector to Wikinews. Although other media outlets reported the alleged plagiarism, the two passages below were dated at least one week prior to the Georgian and Russian crisis. The first two paragraphs of McCain’s speech appear to resemble the Wikipedia article in the history dated July 24, 2008. “Two paragraphs, about an eighth of the full speech, contain material directly copied from Wikipedia or superficially modified from its text. Those two paragraphs constitute the entire factual background of the speech, though — the rest is reaction and proposed policy,” added Vector. Wikipedia – ….one of the first countries in the world to adopt Christianity as an official religion. McCain – ….one of the world’s first nations to adopt Christianity as an official religion. Wikipedia – After the Russian Revolution of 1917, Georgia had a brief period of independence as a Democratic Republic (1918-1921), which was terminated by the Red Army invasion of Georgia. Georgia became part of the Soviet Union in 1922 and regained its independence in 1991. Early post-Soviet years was marked by a civil unrest and economic crisis. McCain – After a brief period of independence following the Russian revolution, the Red Army forced Georgia to join the Soviet Union in 1922. As the Soviet Union crumbled at the end of the Cold War, Georgia regained its independence in 1991, but its early years were marked by instability, corruption, and economic crises. We did not copy Wikipedia in Sen. McCain’s remarks. There are only so many ways to state basic historical facts and dates and that any similarities to Wikipedia were only coincidental. McCain’s campaign denies they plagiarized Wikipedia, but also didn’t state whether they used it as a source for his speech. “We did not copy Wikipedia in Sen. McCain’s remarks. There are only so many ways to state basic historical facts and dates and that any similarities to Wikipedia were only coincidental,” said a spokesman for the McCain campaign, Brian Rogers to The Politico. Wikinews contacted McCain’s campaign, but has yet to receive a response. Wikinews e-mailed Jay Walsh, the director of communications for the Wikimedia Foundation to see what they thought of the situation, and what if anything they planned to do about it. “I would say it’s a good practice to attribute text or content whenever possible. Obviously when it’s a matter of copyright then there are legal considerations, but the Foundation is not able to examine individual cases,” added Walsh. Wikinews attempted to contact Mike Godwin, the legal counsel for the Foundation, but has yet to receive a response. Vector stands by his claim and also notes what he calls ‘dishonesty’ on the part of McCain’s campaign. “What concerns me more, as a voter, is the ethical issue. Plagiarism comes from dishonesty and intellectual laziness on the part of an individual, but McCain’s campaign’s later denial adopts that individual’s dishonesty,” stated Vector. Former President Pervez Musharraf, of the Islamic Republic of Pakistan, has vacated the presidential home of Aiwan-e-Sadr after stepping down from the office of President. On Monday Fahmida Mirza, Speaker of the National Assembly of Pakistan, signed and accepted the resignation of President Musharraf. For 44 years I have safeguarded the country and will continue to do so. He was accorded a guard of honour before leaving the President’s House. President Musharraf resigned after remaining in power for nine years. He had been facing impeachment on charges of violating the constitution and gross misconduct. 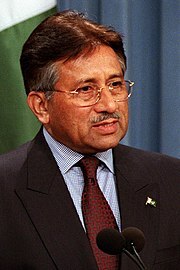 The movement to impeach Pervez Musharraf was an August 2008 attempt by the Pakistan Peoples Party, the Pakistan Muslim League, Awami National Party, and Jamiat Ulema-e-Islam to force Pakistan’s President Pervez Musharraf out of office. Pervez Musharraf announced his resignation at 13:00 Local time (07:00 UTC) in a televised address to avoid impeachment. In it, Pervez Musharraf explained in Urdu language his reasons for resigning. Just three days ago, the chief spokesperson for Pervez Musharraf denied reports that came out 14 August, 2008 indicating that the president would step down within days. Before departing, President Pervez Musharraf met with many important figures including General Ashfaq Pervez Kayani, the Chief of the Army Staff, and Air Marshal Tanvir Mehmoodand, Chief of Air Staff. President Musharraf says he has no plans to leave the country and will remain with his family in Islamabad. Chairman of the Senate of Pakistan, Muhammad Mian Soomro, took over as Acting President of Pakistan after the departure of President Pervez Musharraf’s. The Secretary Election Commission of Pakistan, Kanwar Dilshad, announced on August 22, 2008 that the presidential election will be held on September 06, 2008. The Central Executive Committee of Pakistan People’s Party has nominated the Pakistan People’s Party Co-chairman, Asif Ali Zardari for the post of president of the Islamic Republic of Pakistan. Senator Barack Obama from Illinois, the presumptive nominee of the Democratic Party, announced Joe Biden as his Vice Presidential running mate. The announcement came via text message early Saturday morning, to people who had signed up to receive the announcement on the official Barack Obama campaign website. Friday afternoon, several campaign officials had informed the media that the text message announcement would be distributed Saturday morning. Reportedly, the announcement would come a few hours ahead of a scheduled rally at the Old State Capitol State Historic Site in Springfield, Illinois, where Obama and and whoever the VP candidate would be would appear together for the first time as the Democratic ticket. Biden had been one of the top choices for being the VP candidate according to Rasmussen polls. Following his trip to Georgia, from August 17th through the 18th, he was surrounded by a lot of speculation that he would in fact be the candidate. Prior to the announcement of Biden being the VP candidate, Evan Bayh, Hillary Clinton, Chet Edwards, Tim Kaine, Bill Richardson, and Kathleen Sebelius had all been reported as being on the short list. Obama has been reportedly calling the potential VP candidates and informing them that they had not been picked. Sources said that Governor Tim Kaine and Senator Evan Bayh had been told they were no longer considered. None of the other choices had stated whether or not they had been called, though Representative Edwards specifically stated that he had not been contacted. The 2008 Democratic National Convention in Denver, Colorado begins on August 25, 2008. Biden will reportedly speak on the third night of the convention. Republican candidate John McCain of Arizona has not yet announced who his running mate will be. The 2008 Republican National Convention begins September 1, 2008 in Saint Paul, Minnesota. Biden, a Senator from Delaware, is currently the committee chair for the foreign relations committee. Biden has served in the Senate since 1973, and was the head of the judiciary committee from 1987 through 1995. Olga Kaniskina, who represents Russia, has set a new Olympic record in the women’s 20km walk with her time of 1 hour and 36 minutes. After the race Kaniskina said that the weather did not effect the record.